SIIT has developed FLOATAB® technology, applied on health food supplements, using additives that allow to obtain prolonging of GASTRIC release by floating tablets. The aim can be to counteract to gastric emptying, prolonging the phase of delivery of substances locally acting or only adsorbed at the gastric level. Floatab tablets can be also provided of a fast release layer for immediate dose delivery. The shape can be round, oblong, oval, square, depending what you desire. The surface can be matt or gloss, white or coloured. 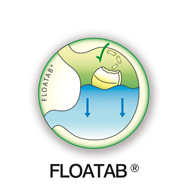 Each application of FLOATAB® on finished products is protected by patents issued or pending.